No worries. I was away on holidays. Hallowe'en 1998 and it is raining at Dublin Heuston Station. KD 240 is with a 91 to the City Centre. This route ran on an adhoc basis, providing extra capacity to the 90 but not going all the way to Dublin Connolly. KD 240 was based at Conyngham Road and was delivered new between 1982/83. One thing to note in this photo is the ticket machine beside the bus. Free standing ticket machines were, and still are, rare for Dublin Bus. The other notable location that had a ticket machine was Dublin Airport, and there is still one there today. The one in Heuston is no longer there, with most people using Leap cards nowadays. However back in 1998 the vast majority of users were paying cash to the driver. These machines that allowed you to buy a ticket before boarding the bus were a curiosity of their time. I'm not sure KD240 was originally CNY Rd... More likely PHB? I do recall batch KD242-6 being allocated to Conyngham Rd from new, after KD51-70, & 114-124. Not forgetting Cummins-engined KD146. Last edited by testarossa40; 04-11-2018 at 13:55. Early 1990s it was based in Summerhill but I am not sure where it was delivered new. A trip back to the mid-1990s this week. RH 100 is seen turning off Ormond Quay and onto Grattan Bridge. It is operating route 69 from Rathcoole into the City Centre. This is one of the more longer bus routes in Dublin and can trace its origins back to pre-DUTC days. Not only does this route serve Rathcoole but it is only one of the bus routes to Clondalkin village. RH 100 was delivered new to Dublin Bus in 1991. Once it's career was over with Dublin Bus it was sold to Dualway's and joined the tour fleet there. After a number of years doing open top tours around the city it was sold on and in 2018 it is a party bus in Tayto Park in Meath. It is 1987 and Dublin Bus is nine months old. D 610 is seen on O'Connell Street picking up passengers as it operates a 13 from Ballymun. 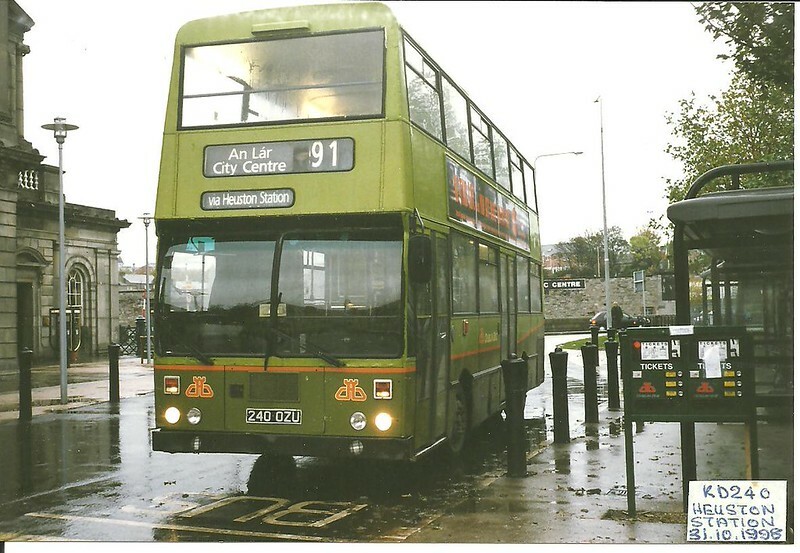 The bus was delivered new to CIE in 1974 and was withdrawn by Dublin Bus in 1992. This was one of 238 buses built by VanHool McArdle. The first (D 603) was built in Belgium but the rest were built in Dublin at Inchicore. Although they were withdrawn from public service by the mid-1990s, some had an extended career on the City Tour. These lasted until Olympians took over in the early 2000s. Route 13 has always been a busy route as it connects the large residential area of Ballymun with the City Centre. The route and its variations have had a number of terminii around the city over the years such as Palmerston Park and Merrion Square, but in 2010 it was merged with some of the 51s and extended to Grange Castle. Last edited by Csalem; 15-11-2018 at 20:06. I cannot think of a more appropriate way to mark the 150th Throwback Thursday than with a photograph of AV 150 on route 150. The bus is seen at the terminus of the route on Fleet Street. The route connects the City Centre with Rossmore via Crumlin. The route began in 1994 under the City Imp brand, replacing route 50. In 2011 it was rerouted slightly to replace route 121 in the Liberties. The current 150 terminus is on Hawkins Street. 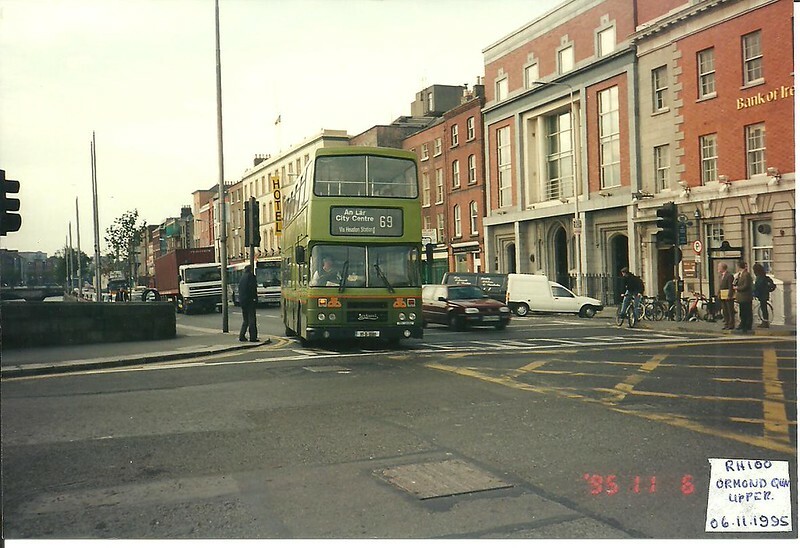 AV 150 was delivered new to Dublin Bus in 2000. It was initially allocated to Donnybrook Garage where it spent most of its career. It moved to Ringsend Garage to finish out its career. By 2016 it had crossed the sea to Scotland to take up work with McColls. Not to ruin the thread... But you can actually see AV150 in all its glory repainted over on the McColls website. A day later than planned and a slightly shorter one. It is 1982 and D 122 is seen on Hawkins Street. The bus had only a short time left in service in Dublin. It had been delivered new to CIE in October 1967 and withdrawn in December 1982 after fifteen years in service. Hawkins House on the right was only five years older than the bus, but in 2018 it is not planned to have a much longer future. Interestingly the destinations shown on the front of the bus are all in Irish. From top to bottom they are "Ranelagh", "Clonskeagh" and "City Centre". 35 years after this photograph was taken, trams returned to Hawkins Street and it is still a busy route for buses. A short hop back to 2012 this week. RV 560 is seen at Dublin Airport with a 16. This was in its final days in service, and was the last high-floor bus in service with Dublin Bus. 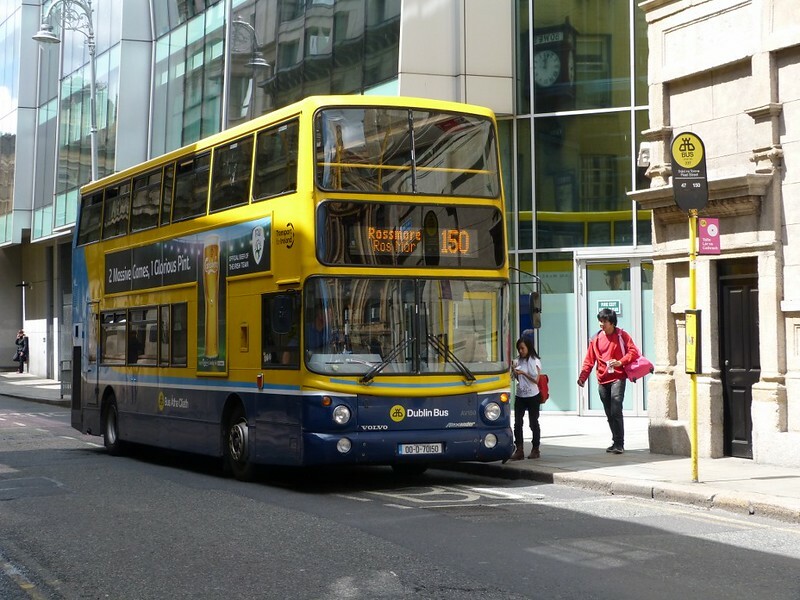 Once it was withdrawn the entire Dublin Bus fleet became 100% accessible. In the background is Terminal 2 which at the time had only been officially opened two years previously. An Aer Lingus aircraft can also be seen landing in the background. In 2019 this airline is due to undergo a rebrand, so will we lose the distinctive green livery? Finally, from the start of December 2018 this bus area is shared with Go-Ahead Ireland who operate the 33A and 102 from here. As a consequence the 16 has seen an increase in services. For this visit to the past we are going to the northern extremities of the Dublin Bus network. 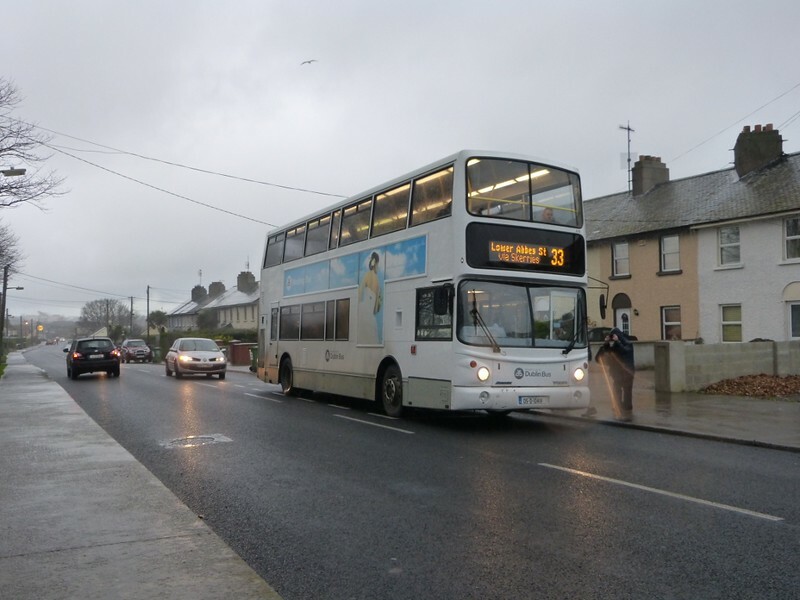 AV 418 is seen in Balbriggan picking up passengers as it operates a 33 to Dublin. This bus was delivered new in 2005 and in 2011 Summerhill repainted into Wedding Bus livery. This was one of the bespoke private hires Dublin Bus used to provide and a slightly unique concept - a bus that can bring your wedding guests from church to reception to home, or wherever you wanted to bring them. When on these duties the bus would be decorated inside with flowers and garlands to make them extra special. The rest of the time the buses could be found on regular duties, but usually limited to certain routes. The 33 was not a regular for them. This is one of the longest routes in Dublin, being approximately 35kms long and it connects towns in north county Dublin with the city. The more rural roads it traverses are not the ideal conditions for a bus painted white. 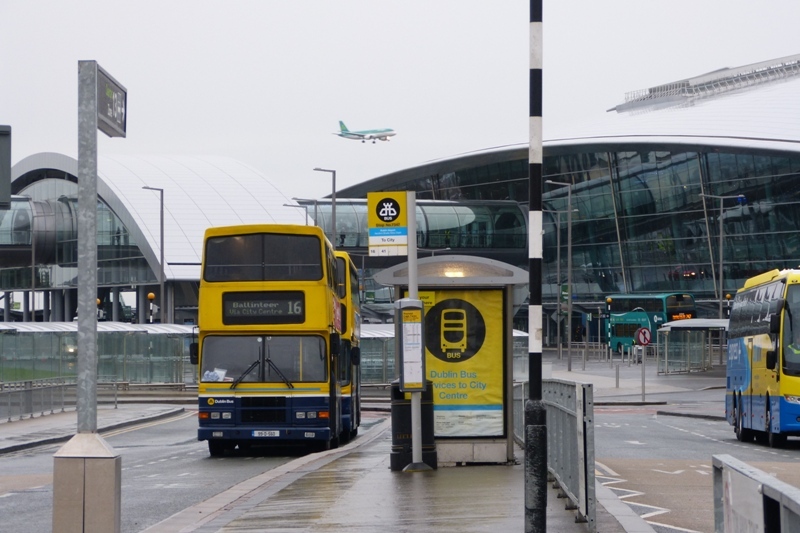 From December 2nd 2018 the 33A, which operated between Balbriggan and Swords, was handed over to Go-Ahead Ireland, but the 33 is still with Dublin Bus. The last Wedding Bus was repainted yellow in 2017. AV 418 went to Harristown Garage after its time in Summerhill and is still there. Last edited by Csalem; 13-12-2018 at 22:37. Always loved the white ALX400's; it really does them justice. It still has the "thank you for travelling with Dublin bus" sign at the front outside the drivers cabin.